One of the most recent hashtag trends to surface social media over the past few weeks has been the #10featuredteachers, a challenge that allows celebrities everywhere to use their influence for the good of education. The rules of the challenge are pretty simple: 1- If you’re a teacher, send a photo and short story about yourself, your district, your school, or your students, 2- Build an Amazon Wishlist and send the link, and 3- Cross your fingers and hope for the best in being a featured teacher on your favorite celebrities Instagram. 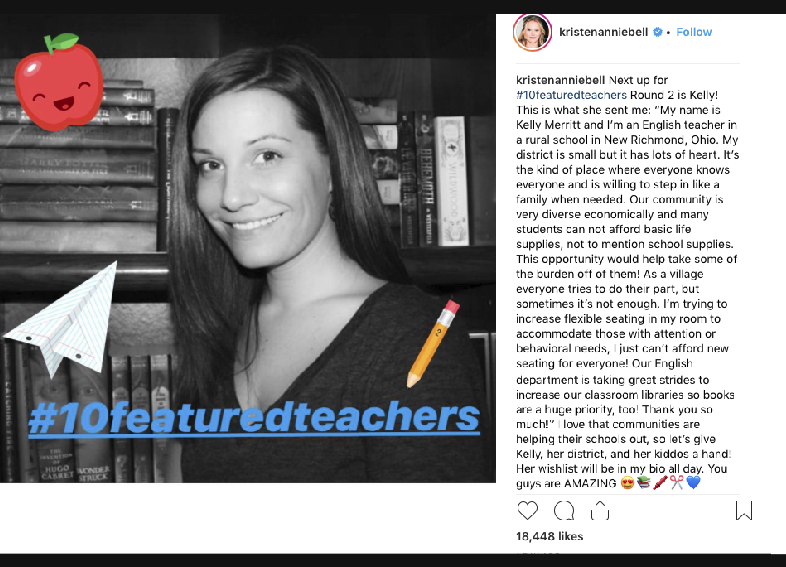 If selected, the teacher is featured on the celebrities Instagram, alongside their story and Amazon Wishlist. From there, the millions of fans and followers on that account have an opportunity to be generous in providing and meeting the needs on the wishlist. For New Richmond High School English Teacher, Mrs. Merritt, this is exactly what she did when she reached out to Kristen Bell. Bell has graced the screens in nearly 50 movies or television shows, most notably for school-aged children would be her role as the voice of Anna in Disney’s Frozen. After being selected, Merritt was not the only one feeling she had hit the jackpot. Of course her fellow coworkers and the families in the community who had been impacted by her were responding well, but it was the response from the students that would prove this Instagram Challenge to be a success. Students immediately took to social media to express their excitement, gratitude, and support for their teacher. Their enthusiasm didn’t stop there though. Since the challenge began, nearly 600 educators have been on the receiving end of this challenge. Collectively, featured or not, teachers could agree that this challenge has benefits reaching far beyond the classroom. From pressures of the jobs outside the teaching aspect, there are expectations to maintain healthy relationships with students and parents, as well as, making certain that students are protected and cared for mentally, emotionally, and physically. This challenge has raised awareness that teachers need support in their classrooms that often times cannot be provided by a district or at the state level. For Merritt alone, roughly $4700 worth of merchandise was purchased from her Amazon Wishlist. From books, flexible seating options, even personal care items, this opportunity is positively powerful. The generosity and outpouring of support from those near and far is truly appreciated and a simple reminder that there is still good in this world.